Three bedroom Apartment – 2200sqft All interiors are spacious and modern, with clean, open-plan living, flooded with natural light and ventilation. The apartments are exclusively designed and provide luxurious beachfront living, finished to the highest standards. Each apartment showcases designer Eco-friendly Coconut Wood furniture. -All executive apartments are designed with large rain showers and glass balconies that provide exotic sea views. Nestled on the silver sands of Bamburi beach with enchanting views of the Indian Ocean, Cowrie Shell is minutes away from everything. The exquisite development is a ‘stone throw’ away from Mombasa City. So you can be at the center of the action whenever you desire. Bustle or quietude within minutes. From the enviable location, you can enjoy the best of both worlds - nearness to all Mombasa’s famous restaurants, shopping centres, business districts and also the quietness of the special beach location. 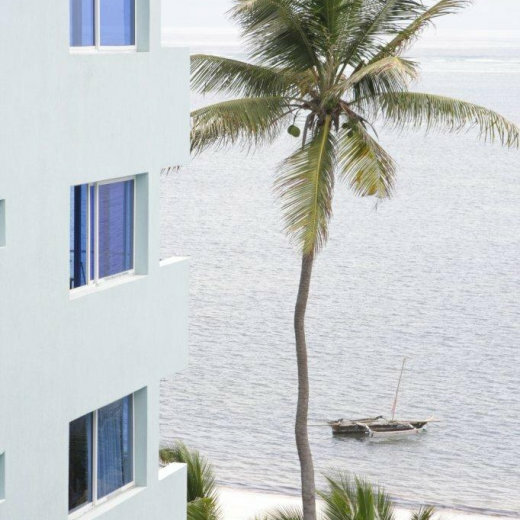 Cowrie Shell is a tasteful development of 85 elegantly furnished and serviced, luxury beachfront apartments. Being a symbol of wealth and class, we journey an extra mile in delighting our residents with the finest services, a rich ambience and a kingly experience. These apartments are fully furnished with high quality fitted German kitchens, fridge, ac in all rooms, German sanitary ware, glass shower cubicles, and Spanish tiles. It uses eco-friendly designed, solid wood coconut furniture in all apartments. Suli Suli Bar and Restaurant available. The spectacular view of Bamburi Bay and the extensive Indian Ocean from our Beach front restaurant is a feast for the eyes. Choicest cuisine and delicacies shall keep your taste buds tickling for more. Beverages consisting of soft and hard drinks, including liquor and cocktails in a combination that is rare to find, are all laid for you to satiate your hearts’ desire. We had an absolutely fabulous time and thoroughly enjoyed our stay. The place is beautiful and the staff were friendly and helpful. Plans of a return trip are already in the process. It was excellent. Enjoyed our stay here. It's a nice place but I think it's pretty new so not many people know about it. In the one bedroom apartment where I stayed they put all the lights on but it would be nice to have a switch to turn on just some of thel ights. It's not a big thing really but might save some electricity. Very positive experience. We stayed in one of the studio suites. It was very clean. Lovely. Not all suites are oceanview so be sure to request one. Everyone was very attentive. The suite we were in had all of the cooking essentials you could but no pepper or salt. Maybe leave some basics for guests would be a good idea.